Venomous mammals?! That's a thing?? Yes, venomous mammals are real. In fact, there are 16 of them. Learn all about them here. Before we jump into the 16 venomous mammals, we need to answer a pretty important question: What's the difference between poison and venom? While this may not seem super important, it could actually mean life or death. As you read other articles and websites on mammals and other types of animals, you might notice that writers tend to use the words poison and venom interchangeably. There is a big difference between the two though. Poison – Poison can be absorbed through your skin, inhaled, or consumed (eaten). Venom – Venom has to enter the bloodstream, most commonly through injection or bite. Check out our post all about poison vs venom for more info, or continue reading this post! Solenodons are found in different parts of the world. They have long noses and small feet with sharp claws. Some think that they look like lemurs. Scientists aren't sure how long the animals can live because they only observed solenodons in captivity. Solenodons typically eat worms and small insects, though they can also consume reptiles and other small animals with bones. You can learn more about solenodons and the different species of this animal. The Cuban solenodon is a type of solenodon native to Cuba. As a nocturnal species, it is only moves and feeds at night. The mammal often scurries through the woods and forests to find its primary sources of food, which include reptiles, insects, rodents and birds. This type of solenodon uses bite saliva to both survive and defend itself. The venom produced through its salivary glands can stun prey long enough for the animal to finish feeding. Solenodons bites can cause some pain in humans too. Due to a lack of numbers, experts added the Cuban solenodon to a list of extinct species in 1970. When several of the mammals were found in 1974, it left that list. As this type of mammal only lives in Cuba and in limited numbers, it is now an endangered species. Another type of solenodon is the Hispaniolan solenodon. The Hispaniolan solenodon resides in Hispaniola, which is an island that is part of both the Dominican Republic and Haiti. The mammal is venomous because of the saliva that it produces, which is spread through bites. Solenodons usually do not produce enough venom to kill a human, but they can kill a wide range of animals with their saliva. A single bite can cause paralysis and even death. Similar to the other type of solenodon, this mammal is slightly longer and weighs a little more. As an endangered species, it has safe habitats. Often regarded as harmless, moles are the punchline to many jokes. You might remember seeing Mole Man on “The Simpsons” or hear people joke about being as blind as a mole. The European mole produces venomous saliva that it uses to attack prey through a single bite. The European mole is not likely to attack humans, they are very antisocial animals. It is always best not to antagonize these animals because they do have sharp teeth and can bite through the skin and inject saliva in its prey. The saliva paralyzes the victim and gives the mole time to eat it. European moles will often paralyze victims and bring those animals back to their homes where they slowly eat them over the long winter. The prey tracked by these moles include mice, rabbits, and other small animals. Depending on where you live, you may find that shrews build homes in your backyard and underneath outbuildings, including garages and sheds. Also known as the Southern water shrew, the Mediterranean water shrew lives in the warm waters of the Mediterranean Ocean. It produces venom that gets into its victims through the bites that it inflicts. As these shrews are very small, they don't produce toxic effects in humans. If bitten by one, you'll likely feel some intense pain and notice some swelling around the bite. Though you can care for the bite yourself, you should see a doctor. The venom that the shrew produces is deadly to the fish and other marine life in the ocean. It can produce enough venom to completely kill certain types of fish in mere minutes. One of the venomous animals found in the United States is the Northern short-tailed shrew. It lives in the northeastern portion of the country and can live in both the United States and Canada. The shrew produces a toxin that acts as venom through its salivary glands. The toxin is strong enough to paralyze animals the same size as and slightly larger than the shrew. Humans who handle the animals must wear gloves to protect against that toxin, which can feel quite painful. A bit from a Northern short-tailed shrew can also cause some inflammation and redness. Americans living in Georgia, North and South Carolina and other parts of the southeastern region can encounter Southern short-tailed shrews on their walks. They may even see this animal coming into their homes. As with other types of shrews, the southern short-tailed produces a toxin through in its mouth that it spreads to victims through bites. Those bites can paralyze other animals and cause significant pain to humans who receive a bite. Some of the natural predators to this shrew include foxes owls, skunks and some types of snakes. Southern short-tailed shrews can either bite and then drag their prey home or feast on the prey in the wild. Elliot's short-tailed shrews are another type of venomous shrew located in the United States. Common to parts of the Midwest, it usually lives in Iowa and Kansas and other flat states. These shrews have the same bite saliva that stuns and paralyzes other animals. It usually preys on small mammals such as mice and can eat insects and reptiles. The process of biting and paralyzing prey usually only takes a few minutes. Elliot's short-tailed shrews also produce a type of odor that lingers on their skin. This scent repels other animals and helps the shrews stay protected from larger prey. The combination of its bite and that odor can protect the shrew for long periods of time. Everglades short-tailed shrews are cute little shrews that live in Florida around the Everglades, as you would guess. Much like the other American short-tailed shrews, they distribute their venom through their bite. The venom is toxic enough to paralyze and kill the shrew's prey, but not deadly to humans. It can cause severe pain however, so bites should be avoided. As if I need to tell you not to let something bite you. The Eurasian water shrew is a type of shrew that lives in the northern regions of both Asia and Europe. These are more solitary than other types of shrews and prefer living on their own rather than in groups. It produces saliva that spreads through the bloodstream when it bites its prey. This saliva can paralyze the animal and give the shrew time to eat the animal. A bite can cause pain in humans too. If you work with these shrews or spend time around their homes, you should always wear protective gear, including long pants and gloves. The real vampire bats are quite different from those that you see in television and films and share very little in common with Count Dracula. Vampire bats include several different species of bats who primarily feed off blood. Warning! The video contains images of blood, don't watch if you're squeamish! You generally shouldn't fear the common vampire bat because it rarely attacks humans. The bats have a type of sensor located in their noses that help them identify their prey and where the blood flows inside that prey. When they attack, they usually do some from the ground. The bat will bite a victim with its sharp teeth and draw blood into its mouth, which it then swallows. Vampire bats have saliva with a property that stops the blood from clotting. This gives them time to get sustenance from the prey before it stops bleeding. 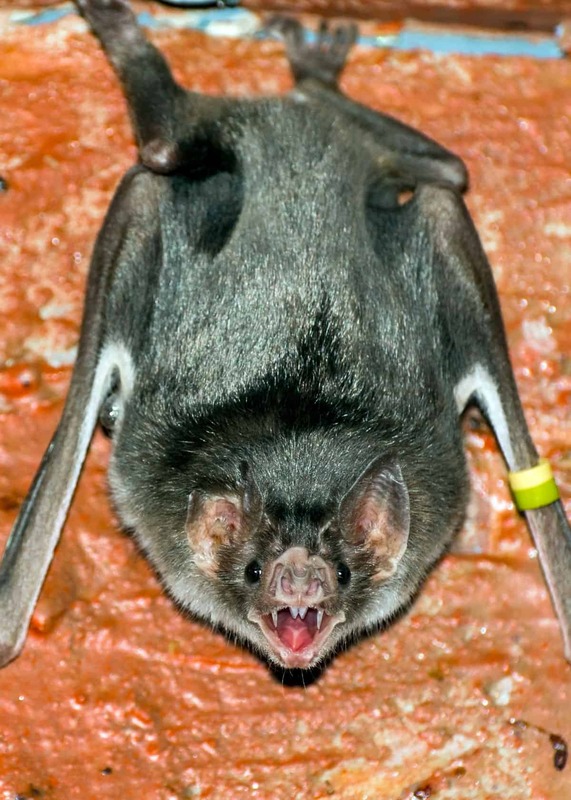 The anticoagulation saliva of the common vampire bat may have medical uses. There is talk of how it may benefit stroke suffers, helping to dissolve blood clots. During their younger years, vampire bats will stick to their mothers and drink their milk rather than blood. Found in some of the same regions as the common vampire bat, the white-winged vampire bat is usually light or dark brown with white tips on its wings. Originally discovered in the 1890s in South America, it still lives in parts of South and Central America today. White-winged vampire bats are potentially dangerous because they can attack other animals and sometimes people. Their saliva keeps blood from clotting, which gives them time to feed. They sink their sharp teeth into the prey first and then produce saliva to keep the blood flowing until they're done. Another type of vampire bat is the hairy-legged vampire bat, which usually feeds on birds. The bats have unique tongues that they use to expose an area to bite on the prey. It will then lick the area to break down the skin and make it softer before it bites. Hairy-legged vampire bats typically take up to 30 minutes to feed off a bird and can do so while hanging from a tree beside that prey. The bats usually cannot go more than 48 hours without feeding. Hairy-legged vampire bats rarely live in the same areas as humans and seldom attack humans, though other types of vampire bats will attack when threatened in any way. The platypus is easily one of the most unique creatures in the animal kingdom. In addition to having the same type of fur and body of an otter, it also has a bill like a duck, the same tail as a beaver, lays eggs, and has venom similar to that of a snake. When first spotted, experts thought it was a hoax. Its classification has changed a number of times, but right now it is considered a mammal. The platypus has hind legs with spurs that stick out slightly. When they feel threatened, they can raise their legs and dig the spur into a predator, injecting venom into the other animal. They have venom sacks, but these sacks only appear during the mating season. Some experts found that the venom is similar to that produced by certain reptiles. It's possible that the platypus might view you as a threat and attack with its spurs, though this is unlikely. You should avoid handling and being around the animal during mating season. There are a few more animals that scientists haven't officially marked as venomous, but I feel they deserve their place on the list. Let me know what you think in the comments! Though it looks adorable and friendly, the slow loris reacts quickly when it feels threatened. Found in parts of southeastern Asia, the animal looks similar to a lemur and has big brown eyes with a small pink nose. These animals also have brachial glands that produce a venom that can significant pain. Though some think the effect this gland produces it simply a symptom of an allergic reaction, others believe that it's a type of venom. There is some debate as to whether the slow loris is really venomous, but it is accepted by most as the only venomous primate. At any rate, the brachial glands are located near the elbow/armpit of the primate. So, when it wants to bite, they lick the area to get the venom in their mouths and then bite to inject it! I feel it important to mention that these animals should never be kept as pets. They are wild animals and despite how cute they are, they are not our toys. Spread awareness! Though the maned rat is not dangerous on its own, it becomes quite dangerous due to the poison that it finds in the wild. This type of rat searches the wild for poison arrow trees and chews on the tree to release a type of liquid. It then rubs that liquid all across its hair. When a predator attacks, the maned rat will lean forward and expose some of the poison hairs on its back. The attacking animal will get a mouth full of the poison, which will either paralyze or kill it. This gives the rat time to escape. One of the more popular and unusual pets found in the United States today is the hedgehog. Though it looks adorable and can fit in the palm of your hand, it's also more dangerous than you might think. Hedgehogs have spikes on the backs of their bodies. When they feel threatened, they curl into a ball and use those spikes to fend off attacks. Those in the wild will find poisonous toads and lick and chew on the skin of those toads. They then spread the poison secreted by the toads on their spikes. If an animal attacks, that poison can kill or seriously injure it. What do you think of these venomous mammals? Did any of them surprise you? Let us know in the comments!